Need help setting up your peer review assignment? All our tools are set up in steps. In Step 1 you will set overall instructions. In Step 2, you set the options for handing in work. In Step 3 you set the feedback deadline, criteria, and the required amount of reviews. 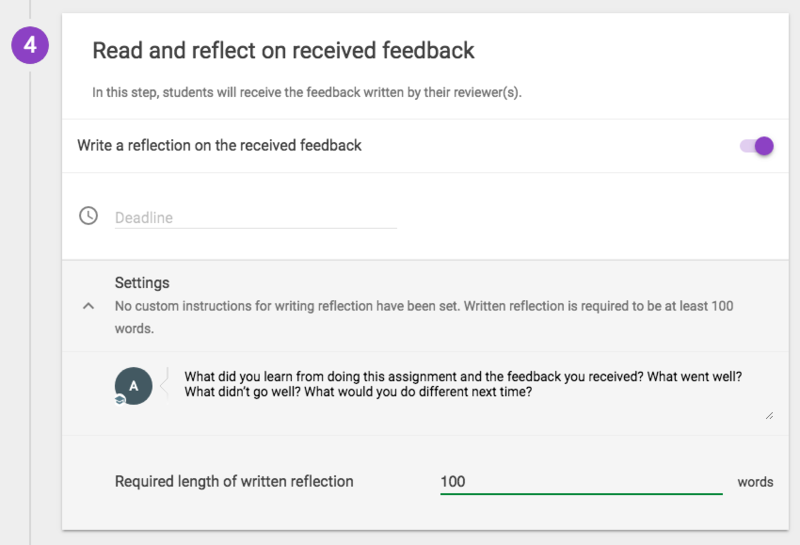 In Step 4 you have the option of requiring students to write a reflection on the feedback they receive. The title, in the example: Peer Feedback, can be changed from within the LMS (Blackboard, Brightspace, Canvas). You can also fill out a different title here, but in this case the old name will show in your course-overview. Click use copy of existing to select a previous Peer Review assignment of you or one of your colleagues. A copy of this existing assignment will be made, copying all teacher contributions (instructions, deadlines, criteria). Student contributions are not copied. After the copy is made, you can adjust all settings you need. Fill in instructions. Fill in your overall instructions for the assignment (see the screenshot below for an example). Note that you will not be able to publish/save the assignment if you leave this field blank. Hand in individually, review individually. Use this option if you want your students to individually to hand in their assignment and then be linked to (a) random peer(s) who has also handed in work in this assignment. Hand in individually, review within groups. 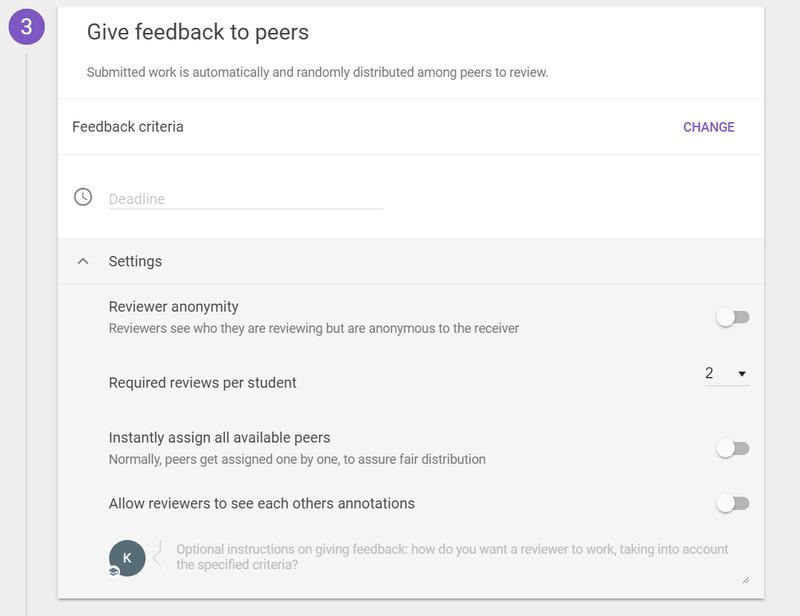 Use this option if you want your students to individually hand in their assignment and you want to use smaller groups to distribute the reviews. Let's say you have a class of 20 students and you want 5 groups. In this case students will review the work of (a) peer(s) from their group of 4. Hand in as group, review work by other groups individually. Use this option if the assignment that needs to be handed in, is made by a group of students. Let's say you want your students to work in groups of 4 on the assignment. They hand it in as group and then the individual students randomly get work distributed from another group to review. In this scenario, if every student writes 1 review, every group receives 4 reviews on their work. Click here for a detailed guide to assign students to groups or to take over groups from your LMS. Instructions (optional) If you have specific hand-in instructions for your students (such as the desired font, line spacing, naming the file, etc.) fill them in here. Example: Please name your student number in the file-name. Upload both your essay and the slides you will use when presenting about your essay. Deadline Set the hand-in deadline. Students have to upload their work before this deadline. When this deadline has passed, students will be assigned work of a peer or group to review. When no deadline is set in this step, students are assigned work to review when 2 students have handed in. Click here for an explanation about how peers are assigned. Required submissions Set the amount of files that students are required to hand in. Note that students' will not be assigned to a peer for review if they submit fewer files than required. Students can always hand in more files than required. In the example given in the screenshot, you would set this to 2: they hand in a word doc and slides. Allow students to hand in these file types Check the box next to the file type you want your students to hand in. Students will not be able to upload file types to you deselect. For an overview of which formats are supported for each file type, click here. 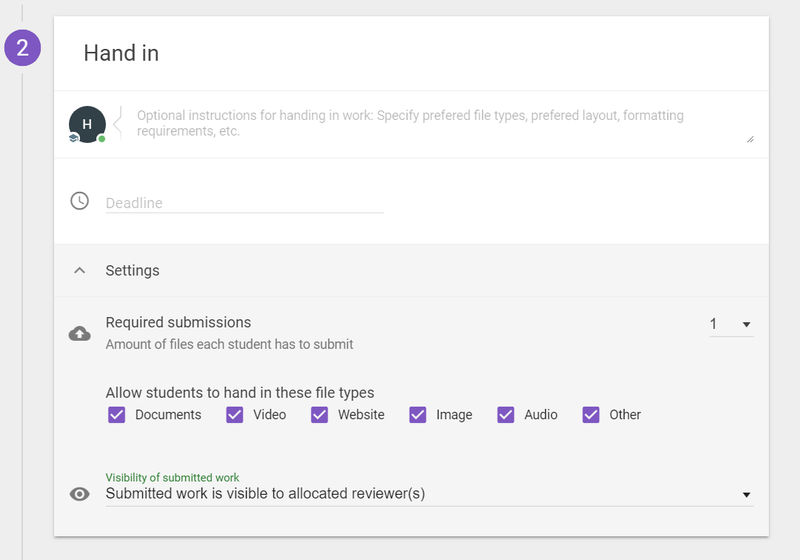 Visibility If you select submitted work is visible to allocated reviewers, handed-in work and the feedback provided is only visible for the student who submitted the work, the reviewer, and the teacher. 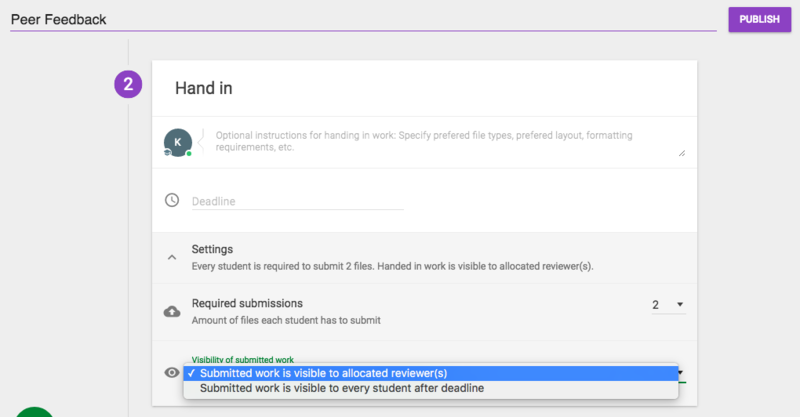 If you select submitted work is visible to every student after the deadline, every student will be able to view the work and its review(s). Students will also be able to comment on the feedback, and give up-votes (likes) to feedback/comments. Note that if you choose this option and do not set a deadline, submitted work will be visible as soon as it is uploaded. In this step, you specify criteria to help guide students as they give feedback. Click change to edit, add, or delete criteria. Click here for a detailed guide on setting criteria. Deadline Set the deadline for giving feedback. Note that reviewers will not be able to view or edit their reviews after this deadline passes. Leave the deadline blank to allow reviewers to view and/or edit their feedback indefinitely. Reviewer anonymity (beta): Enabling this option will make reviewers anonymous. Reviewers will still see the name of the peer they are reviewing. Teachers can also see the name of the reviewer. Note: this feature is still in beta, so it is not currently available to all users. If you wish to use this feature, please send a message to support via the in-platform support chat, or send an email to [email protected]. Required reviews per student Specify how many peers/groups each student has to review. Reviewing multiple peers is good practice, giving students a broader view of how their peers did in the assignment. At the same time, it means that students get reviewed by several peers, giving a better, more nuanced view of their own efforts. If you set this to "all," students will have to review everybody in their group, be mindful of the student workload when using this setting! 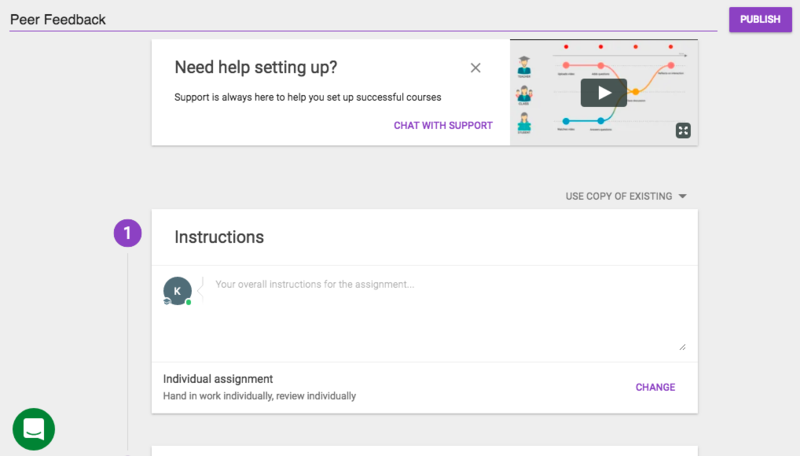 Instantly assign all available peers: With this option enabled, students will be assigned all the reviews they'll have to complete at once. The advantage of this is that students will see all their peers at once. The disadvantage is that it allows for less flexibility, i.e. if students only complete 1 review, the others can no longer be assigned to someone else who does complete all the reviews. Written reflection (optional). This reflection is written by the student who received feedback and is visible only to themselves and the teacher. Deadline. Students will not be able to write a reflection after the deadline passed. Note that students can still view the feedback and their reflection after the deadline. If you do not set a deadline, students can write and/or edit their reflection indefinitely. Under Settings you can customize your instructions for the written reflection. See the screenshot below for the default instructions. You can also set a minimum required length of the written reflection. Finally, click Publish in the top-right corner of the screen. You can always come back to edit settings by clicking the three dots in the top-right corner of the screen and click edit.